We have created several software tools to support the indivdual engineer in tracking and analyzing his or her personal software development process. 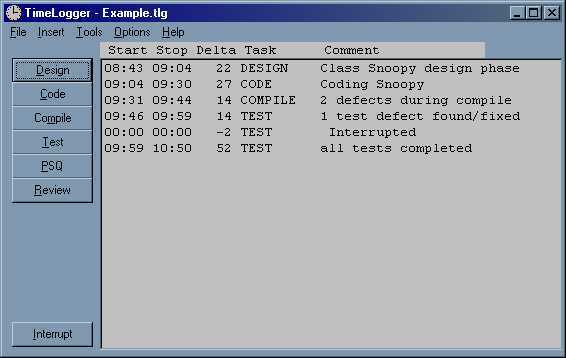 Specifically, we have created a Time Logger, a Defect Tracking database, and a Project Summary database. These tools are provided to participants in our PSQ course as part of the course materials. In addition, we are making the Time Logger tool available here for free. The Time Logger is a Windows desktop utility that works like a stopwatch. Its intent is to help programmers keep track of the time they spend in the different phases of software development. This is not a general purpose time tracking utility, there are many excellent commercial ones available. This tool was built specifically to support the processes taught in the PSQ course. Directions for use are included in the Help menu.